A rental agreement is a legal document where terms and conditions (right to occupy the premises to a tenant, tenancy rights are created, etc.) are framed under which the rented property is leased out, the agreement is made between the landlord and the tenant. It gives the tenant a right to use the immovable property for a certain period of time for its residential purpose in return of monthly rent. It is good to be one the safer side and make a rental agreement. In case the relationship turns bitter or any fraud and misunderstandings that could potentially lead to trouble, disputes, financial losses or litigation, it can be used in the court. Both the lessor and lessee of a residential property can use a rental agreement or lease deed format. It is signed by both the parties to specify that they agree to the conditions placed by the lessor in the rent deed. 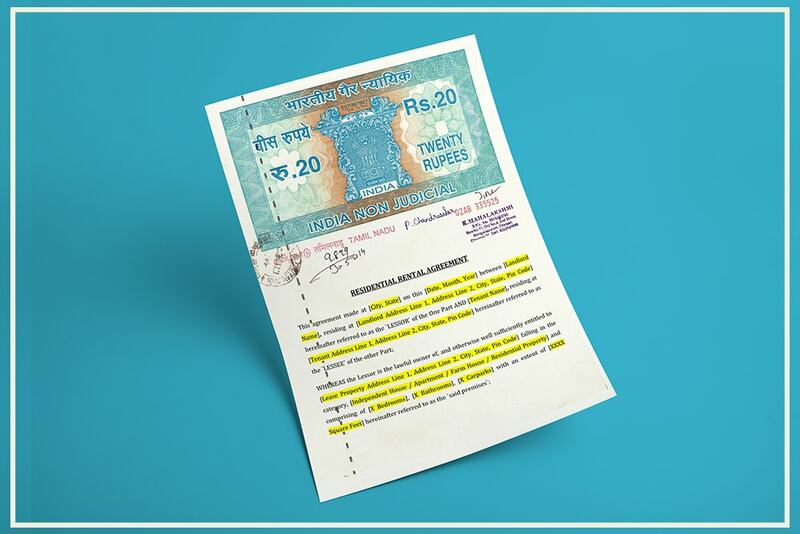 It is a legal document having the force of rental law which can be used in courts in case of a disagreement between the parties. 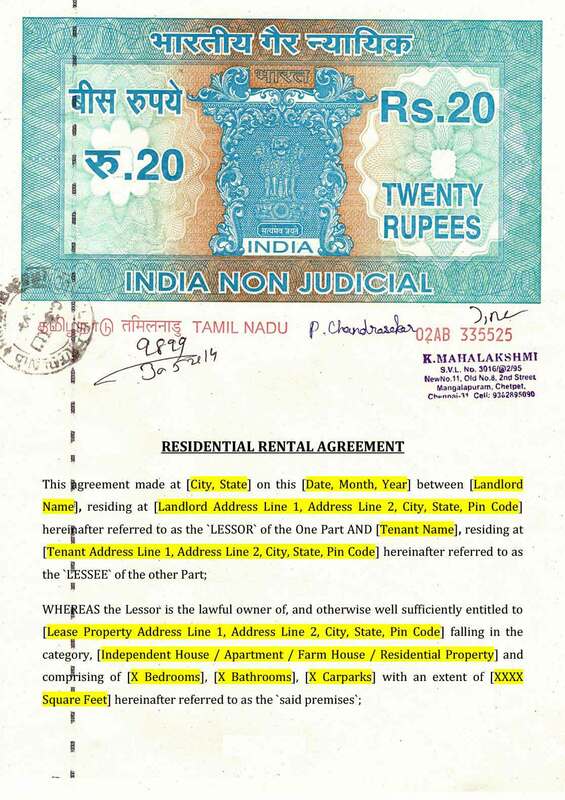 The rental agreement is printed on a Non-Judicial Stamp Paper with a value of Rs.100/- or more depending on the rental property value. The deposit of some money as security is done while making the rental agreement. Two copies of the document are made; with each party have one of the original copies as a record. Most landlords prefer to enter into a rental agreement for a contractually specified period of 11 months in India. A period of 11 months is preferred by most landlords because there are two types of agreements that deal with rental property in India, lease agreement and leave & license agreement. Under a leave and license, the amount of rent or increase in rent can be contractually determined by parties. Rental agreements that are made of 12 months and over it have to stand by firm rent control laws that are mostly in favor of the tenants. The rental control laws currently prevent the tenant from the landlords to overcharge and also safeguard the tenants from abrupt or unfair eviction. It is vital that a leave or license or lease agreement is signed only with the real owner of the house. In case of lease agreements, the right to ownership of the property gets transferred from the landlords to the tenants. It becomes difficult for the landlord to vacate a tenant if it not made properly and terms and conditions are not charted down as per rules. Hence, Landlords prefer to have agreements that are below 12 months in India. Rental agreement or license agreements are made for a period of 11 months, with an option to renew the agreement (if both parties agree) at the termination of the agreement. As a rental agreement that is for the period of 11 months is just a license for the tenant to avail the premises for a given duration. Hence, in most states of India, the rent control laws do not apply. Further, the landlord needs to take more precaution measures in case of eviction of a tenant from the property. Hence, most landlords prefer to have the rental agreement that is for the period of 11 months and frame the terms and conditions which need to be followed by both parties. The agreement is also having an option to renew at the end of the agreement period.